To critique the Nicholas Hytner-directed version of The Crucible is to essentially critique the play itself, both the strengths and the pitfalls accompanying that. Playwright Arthur Miller came aboard to adapt his seminal, big-concept take on the Salem witch trials for the big screen a little over fifty years after he originally wrote his play, after many years of its themes being dissected in schools across the country. Those themes, which revolve around mass hysteria and the dangers of accusations used as tools for revenge, deflection, and religious purity -- sparked by the McCarthyism of the ‘50s -- have endured as sociopolitical issues for half a century and continue to endure over twenty years since the film's release. 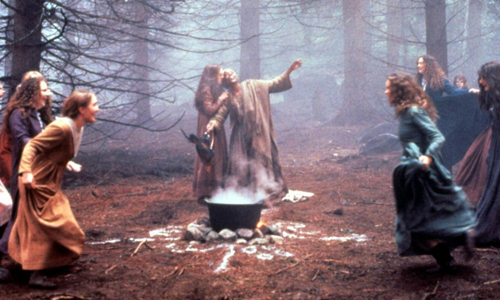 There's a staginess to Hytner's execution of the setting and dialogue that detracts from The Crucible as an immersive cinematic experience, along with certain theatricalities of the performances, but the weight involved with Miller's lasting representation of the "witch-hunt" speaks over those hindrances in creation of fiercely expressive and thematically hefty period drama. During a period in the 1690s, an excessive number of people were accused of practicing witchcraft in colonial Massachusetts, resulting in over two-dozen deaths either by hanging or imprisonment. The evidence? Little more than the ravings of children, claiming to have been touched by the devil and, thus, able to see the devil doing his work around those who practice witchcraft, emphasizing the power of religious belief in the puritanical townships. Arthur Miller took that conflict, alongside the recorded feud between the Putnam and Proctor families, and channeled it into a tale of revenge, infidelity, and heretical fearmongering, hinged on young teenager Abigail Williams (Winona Ryder) and her affection for John Proctor (Daniel Day Lewis). After being caught at a witch's gathering in hopes of fully winning John's love, she and the daughter of the town's minister (Bruce Davison) clear their names by blaming the devil's persuasion ... and indicate that they, along with a growing number of other girls, can see who's on the side of the devil. This begins the accusations, fueled by pettiness and resentment, which eventually draws in John's wife, Elizabeth (Joan Allen). There's an effortlessness to the production design and photography capturing colonial Massachusetts in Hytner's The Crucible that's both reflective of the period and somewhat unexciting to watch onscreen. In a sense, the sparseness and rusticity are similar to how one might imagine the setting to operate on a stage, offering glimpses inside the houses, churches, and other buildings that have been shot with unpretentious frankness, emphasizing the confined space in which fiery theological and moral conversations take place. How the puritanical colonies are captured by Hytner and his cinematographer Andrew Dunn -- whose later work ranges from rom-coms like Sweet Home Alabama to period films like Count of Monte Cristo -- allows for these thought-provoking aspects of Miller's play to stand on their own, without much artistic interference beyond a few distinctly ‘90s tilted dutch angles and certain scenes visualized that happen off-stage in the play. The hands-off sparseness has its merits, but it also encounters issues when viewed through the lens of cinematic drama, where selling the historical illusion comes across as an obligation rather than a creative endeavor. Instead, Hytner's The Crucible focuses on the intensity of bold, troubled reactions among the accused and the accusers, and a large part of director Hytner's objectives emphasize bringing candid facial responses more into the roaring hysteria of Salem. The performances behind the reactions are largely potent and fitting for the characters embodied by their actors, notably Winona Ryder as the wild-eyed, sexually- and emotionally-frustrated Abigail Williams, who pours unsatisfied fury and deviousness into the young girl's knee-jerk supernatural indictments and scheming. Daniel Day Lewis is reliably committed as John Proctor, though the overwhelming credibility and dominance of his poise while his character attacks the region's farcical use of the supernatural as "evidence" almost seems less persuasive than it should against the feebler religious zealots. It's in his wife, Elizabeth, that the most profound and nuanced drama takes place, though: Joan Allen navigates the ailments of witchcraft accusations and John Proctor's possible infidelity with delightfully nuanced and restrained agony. Unfortunately, the falseness of the collective of young girl accusers weighs down The Crucible, and that's a reflection of the downfalls of letting certain exaggerated theatrical inclinations of the play try to convey thematic weight on their own. While watching a stage production, it's understandable that certain dramatic elements need to project all the way to the rafters to get their point across, and the gaggle of young girls pointing toward and fainting at the sight of demonic forces falls into that category. Hytner doesn't really attempt to moderate their energy for this adaptaion, though, and scenes where accusations fly and spirits are spotted -- toward obvious targets for the girls' disdain -- ring hollow with their overstated rabble-rousing. By design, there's very little that's convincing about Abigail Williams' team of power-hungry, attention-starved servants of God's will, which muddies the waters of the film's overarching effectiveness. How this township could ever be duped by such over-acting is astounding, and that goes beyond the points made by the story about belief-driven manipulation. Luckily, the themes involved with The Crucible can exist and thrive regardless of whether the accusers themselves appear credible or not. Miller's play focuses on a trove of existential and social concerns brought up by the Salem trials, ranging from broad ideas about false, spite-driven claims and using religion as a tool of pinpointing wrongdoing, to the more complicated nature of circumstantial evidence and the perception of being guilty until proven innocent. Hytner emphasizes these concepts in a lucid and impactful manner, where the futility of Proctor's counter-accusations and the acquiescence of the townsfolk creates the kind of gut-churning emotionality one would hope for out of Miller's story. Despite the period and the circumstances, these are still concepts that remain relevant in the current era, where battles over preserving religious ideologies and baseless condemnation of others complicate our social climate and fill the airwaves. The Crucible tackles its ideas in a disquieting way, and this near-verbatim adaptation of the play offers an amplified but engaging representation of that.